ALL RIGHT MAGGOTS FALL IN! MOVE IT MOVE IT MOVE IT! 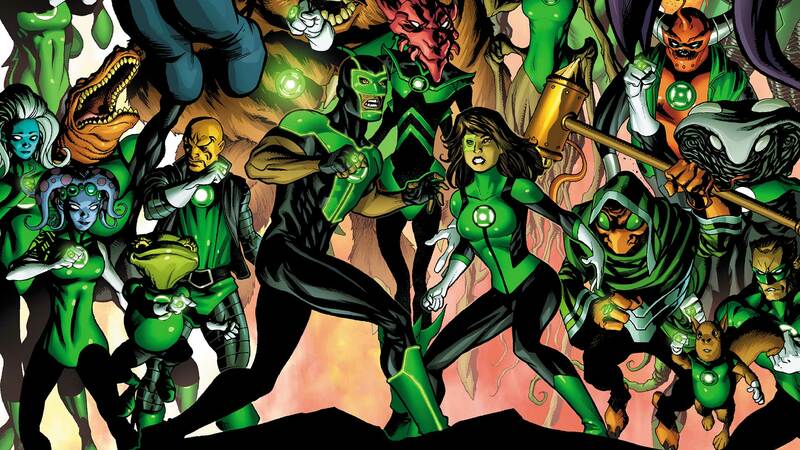 NOW I’M HERE TO TURN YOU SORRY WANNABE GREEN LANTERN READERS INTO CERTIFIED COMICBOOK NERDS. YOU WILL UNDERSTAND WHAT IT MEANS TO BE A FAN OF THE CORPS! NOW PUT DOWN YOUR DAMN TABLETS AND GIVE ME TWENTY! Okay now that I’ve gotten my R. Lee Ermey impression out of the way, you might have an idea as to what this new issue of Green Lanterns is about. So put on your camo suit and prepare to break a sweat recruit! Warning spoilers are ahead, you have been warned. Okay I know what you’re going to say this time around. “But Ben haven’t you praised Eduardo Pansica enough?” To answer that question, hell no I haven’t praised Pansica’s art enough. Given that Humphries wanted to channel Full Metal Jacket for portions of this issues, it was up to Pansica to bring the absurdness to a new level and boy did he. Did Guy’s and Jessica’s faces resemble anything that you would consider normal anatomy? No, but I love the exaggeration of it all, playing up the stereotype of the marine instructor via Pansica’s art made this issue oh so enjoyable. On the reverse end, seeing Jessica’s anguish as Guy put her through boot camp actually made me feel sorry for her. While also bringing up old memories of when I used to play football. Interesting enough, I really enjoyed how Humphries wrote both Kyle and Guy. Yes Guy was a caricature of himself but Humphries voice for both Kilowog and Kyle rang true. For so long Kyle has had to play the Jesus role of the Green Lantern Corps, meaning that his lighthearted personality faded away. Kyle’s training sequence with Baz brought out the lighter side of Kyle, plus the single page of Kyle constructs showcasing each of his various costumes since he debuted in 1994 was a nice touch. As for both Jessica and Simon for this issue, well for most of the issue they’re either face down in mud or aggravated at their instructor oddly enough made me feel for me connected to them. More so for Jessica since she has less experience than Simon and is a true rookie. Despite my overall enjoyment of this issue, when Humphries decided to cut to Rami/Voolthoom I stopped caring immediately. On the one hand I do love that Pansica had the opportunity to draw something that oozed 70’s Jack Kirby but I’m personally tired of digging into the corps past and finding some new hidden history that no else either knew about or hid from everyone else and only brought it up because the plot demands it. It just drags the book down to a slow crawl, yet I know that Humphries will continue to mind this since Volthoom is involved. Green Lanterns #23 was a lot of fun, seeing both Baz and Jessica each receiving their own personal boot camp was pure genius. Thankfully Pansica’s art helped enhance the story once again. If this book didn’t have any of the Rami/Volthoom subplot I would have given this issue a perfect score. However that is not the case, still a real fun issue though.